Parasites that control the behavior of their hosts for their own benefit are a well-documented natural phenomenon, but the discovery of a previously unknown relationship between a parasitic wasp and a social spider is particularly upsetting. Hijacking the brains of unsuspecting hosts is a thing that some organisms do, typically for reproductive purposes. Famous examples include a fungus that controls the actions of carpenter ants, a single-celled parasite that makes the smell of cat urine irresistible to rodents, and a worm that causes infected fish to perform a complex dance. Another parasitic relationship, discovered by scientists from the University of British Columbia, can now be added to this list—and it’s one of the nastiest we’ve seen, both in terms of its complexity and the nefariousness involved. In the new study, published today in Ecological Entomology, lead author Philippe Fernandez-Fournier describes how the Zatypota species of parasitic wasp uses and abuses the social Anelosimus eximius spider, first using it as a getaway car, and then compelling it to build an incubation chamber. Oh, and then it eats the spider. Fernandez-Fournier accidentally stumbled upon the discovery in the Ecuadorian Amazon while studying various parasites living in the nests of A. eximius. These arachnids are referred to as social spiders because they live in large colonies, work together to capture prey, share parenting duties, and rarely venture beyond the cozy confines of their communal, basket-shaped nests. Zatypota larva clinging to its host, an Anelosimus eximius spider. These spiders are rigid in their behaviors, which is why Fernandez-Fournier took notice when he saw some of these spiders, who were infected with a parasitic larva, straying about one or two feet from the colony. That observation was weird and rare unto itself, but the UBC scientist also watched as these same spiders began to spin webs of densely spun silk and bits of foliage. “It was very odd because they don’t normally do that, so I started taking notes,” said Fernandez-Fournier in a statement. Curious, he took the cocoon webs back to the lab. When he sliced them open—to his shock—he saw a developing wasp inside. Realizing he was onto something, Fernandez-Fournier and his team investigated further, uncovering a completely undocumented interaction between the two species. Here’s how it works: An adult female Zatypota wasp lays an egg on the abdomen of an Anelosimus eximius spider. After the larva hatches, it attaches itself onto the spider and feeds on its blood. The larva gets progressively bigger and it starts to subsume much of the spider’s body. Eventually, the spider enters into a state of “zombification,” wherein it’s no longer behaving as its normal self. 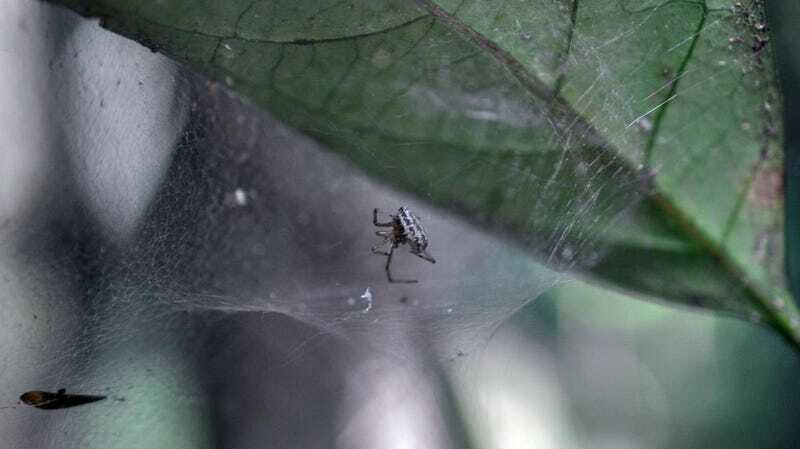 Under the influence of the larva, the spider abandons its colony and sets about the task of building the cocoon web. Once this forced construction task is complete, the spiders stays motionless, allowing the larva to finish the job of killing and consuming its host. Satiated, the larva slithers into the web cocoon, which it uses as an incubator for its next stage of germination. About nine to 11 days later, a fully mature wasp emerges from the cocoon. The cycle begins anew, unfortunately for the next eight-legged victim. The strategy, the researchers say, is unique in that parasitoid wasps have previously only been documented to prey on solitary spiders. In terms of how the wasp larva weaves its hypnotizing spell, the researchers theorize that it injects a brain-altering hormone into the spider. This hormone either tricks the spider into thinking it’s at a different life-stage, or it works as a signal that makes the spider flee from its colony. But these are just guesses. Fernandez-Fournier and Straus would now like to return to the Ecuadorian forest to learn more about these diabolical wasps and their hosts. In particular, they’d like to know if the wasps are repeatedly targeting the same spider colonies, and if so, how that behavior works as an advantage.